The broad topography of the Winecup Gamble Ranch provides for an array of wildlife and recreational opportunities. Species such as mule deer, pronghorn antelope, elk, coyotes, fox, cougar, bobcat, beaver, and badger share their home on the range with our cowherd. In addition, numerous waterfowl find refuge in the cattails and bulrush lacing the Thousand Springs drainage. Along with waterfowl, chukar partridges are another game bird which call the ranch home and offer an excellent upland bird hunting challenge. With a current population of approximately 1800 head of elk, hunting is a strong attraction for sportsmen to northeastern Nevada. 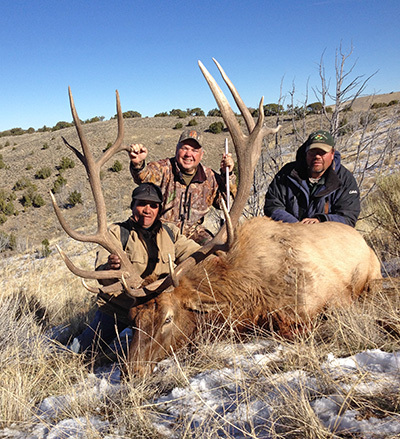 The ranch and the surrounding area are known for producing exceptional trophy bull elk. Our nearly one million acre expanse, of which approximately three-quarters are BLM public lands, provide exceptional wildlife habitat for elk, mule deer, and antelope. For this reason, we have taken measures to ensure our ranch continues to remain home to these wild herds, working in conjunction with the Rocky Mountain Elk Foundation to install wildlife-friendly fences throughout the ranch. Our private and public lands are commingled in a checkerboard pattern across the ranch. While we make no attempts to limit hunters’ access to the majority of our private lands, we do restrict access to some of our bottom ground in the Thousand Springs Drainage. Details on these restrictions and maps can be found here. Hunting permits for the area are difficult to come by due to the random draw and quota system required by the Nevada Department of Wildlife. The ranch receives a limited number of landowner elk incentive tags each year and at times makes them available to outside hunters for purchase. Interested parties can contact the ranch at the beginning of the year to be placed on a first-come-first-served list where they can be notified of tags left over and for sale. For those interested in guided elk hunting opportunities on our legacy ranch, please contact Nevada High Desert Outfitters via phone (775-738-4082) or email (mitch@nhdo.com) for more information. While the odds of taking a true trophy elk are very high, the chances of an unbelievable memory are guaranteed. 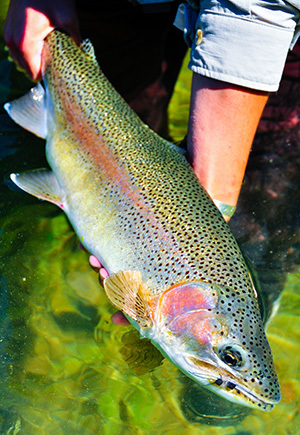 Crittenden Reservoir is located on the ranch and is renowned in the West as a premier trout fishery. Originally constructed in 1955 to provide water for cattle and irrigation needs, the reservoir is fed by a natural spring system and stocked with a variety of species including rainbow trout, brown trout, brook trout, tiger trout, and largemouth bass. This private stillwater fishery can be accessed by membership only with fishing open year-round. In addition, only artificial lures such as flies may be used. Managed primarily for trophy trout with size and limit restrictions, it is not uncommon for trout in Crittenden Reservoir to reach over 20 inches or more in length. Quality largemouth bass are also present in healthy populations. Members from all over the West travel far and wide for the chance to catch one of the 30” prize trout which call this reservoir home. To inquire about membership to this exceptional fishery, please contact our Reservoir and Wildlife Manager, Allen Wilson by phone at 775-776-2511.